Senior Ramallah official reveals, in a light moment, that construction for Jews has stopped. Was he joking? Negotiations between Israel and the Palestinian Authority (PA) are being held under a mantle of secrecy, but a statement made during a lighthearted moment Sunday appears to reveal that that Israel is implementing a freeze on construction for Jews in Judea and Samaria, contrary to the government's official line. 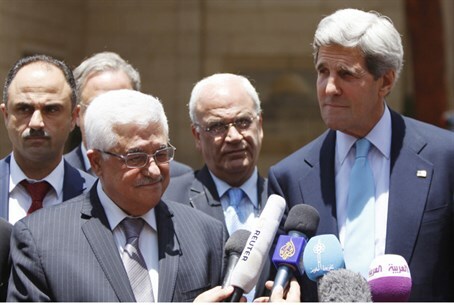 The apparent admission came as Kerry and Abbas met in London Sunday evening. The two were seated in front of reporters, along with senior PA official Nabil Abu Rudeineh. As they chit-chatted, Kerry told Abbas that he is looking good and wondered aloud what was causing this. Abbas did not answer but smiled when Abu Rudeineh answered in his stead. Abbas is happy, said Abu Rudeineh, because there is a freeze on construction in the Jewish communities in Judea and Samaria, and funds earmarked for the PA are being transferred to it. Kerry laughed and said: "That is optimism." Israel's official position is that there is no freeze on construction for Jews in Judea and Samaria. Not only that – Israel has approved the construction of thousands of new homes in Judea and Samaria since the start of negotiations with the PA. It is not clear if Abu Rudeineh was being facetious in his statement, or whether there are behind-the-scenes understandings between the sides which the outside world has not been aware of. In line with Kerry's desire to keep the details of the negotiations secret, both Israel and the US have been tight-lipped about their progress to date. Not so the PA, whose officials – including its own chief negotiator – have issued several leaks, of which this may be the latest example. The PA's leaks appear to indicate a willingness by Israel to make substantial concessions, including the wholesale deportation of thousands of Jews and the transfer of their property to PA Arabs.